This is no pro-life A-lister. It’s not Dr. Alveda King, or Ryan Bomberger, or the National Black Pro-Life Union. It’s Jesse Jackson, writing in 1977. Rev. Jackson is now a stalwart supporter of abortion on demand. He might benefit from some information about the industry with whom he’s decided to throw in his lot – and how when Big Abortion looks at the black population, the only color it sees is green. For the Planned Parenthood Racism Project, Live Action called Planned Parenthood abortion killing centers across the country. Our investigator posed as a potential Planned Parenthood donor, asking if his money could go directly toward the killing of black babies in the womb. The Planned Parenthood employee’s response? “Understandable, understandable.” And this was no low-level staffer; this was a director of development. That’s Planned Parenthood’s true ethos: Profit. No matter what. Even if it means pulling in blood money to destroy black babies in the womb. Martin Luther King, Jr. spoke so eloquently about equality among all people, no matter their race. Planned Parenthood, meanwhile, “understands” a racist’s desire to eliminate blacks from the gene pool. Considering Planned Parenthood founder Margaret Sanger’s devotion to weeding out those she deemed genetically “unfit,” this is not so surprising. But it does deserve our condemnation, and our opposition. Today, in New York City, more black babies are aborted than born. In Mississippi, where whites outnumber blacks two to one, 72% of the babies aborted are black. That a taxpayer-funded corporation – to the tune of $541 million in 2012 – accepts donations specifically for the destruction of black babies would make Dr. King cringe. It should make every American cringe. This is not a matter just for the month of February. The call for true equality under the law, for every human being, of every color, must continue throughout the year. We know that Martin Luther King, Jr. would join us in this effort. 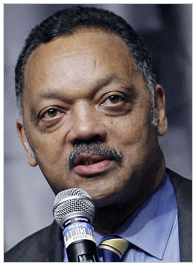 We know that the Jesse Jackson of 1977 would join us against the Jesse Jackson of 2014. We hope you’ll join us, too. P.S. Our undercover investigations shine a light on the abortion industry. Too often, we do the work that state law enforcement and local medical boards refuse to do – and without a dime of forced taxpayer funding. Please support our work with a 100% tax-deductible $100 donation. It’s your generosity alone that helps us make a difference.